From car loans and home mortgages to financial education and outreach, Georgia’s credit unions not only provide much-needed services for members, but also help build communities. A woman in the Macon area found herself upside-down on her mortgage last year. Al-though she had faithfully made her monthly payment for 15 years, she unexpectedly wound up on the verge of losing the home she had worked countless hours to afford. But instead of losing her home to foreclosure or simply walking away from the trouble, as many others have done, she went to see the officers at her local branch of the MidSouth Community Credit Union. After consultation and examination of her situation, her credit union created an outside-the-box solution and a happy ending that allowed her to keep her home. The story is familiar throughout Georgia, where there are 138 credit unions with 450 office locations in operation. They come in all sizes and with a variety of structures, with 34 percent operating a branch in a low-income or underserved area. They offer different services and plans. But, unlike banks that are answerable to their for-profit shareholders, credit unions are owned and controlled by the members, the same people who use their services. The member-owners are the ones who pool the funds that help other members. After expenses and reserve requirements are met by the credit unions, the revenue is returned to the members through lower loan rates and high savings rates, as well as lower costs and fees for services. Although the various credit unions have their own branded names for the philosophy, the credit unions generally refer to it as “helping members afford life.” That motto equates to lower rates on loans, higher returns on savings accounts and lower fees for banking services. 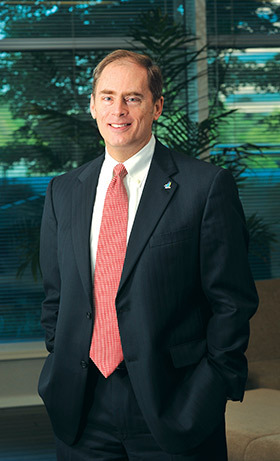 Hank Halter, president and CEO of Delta Community Credit Union, which is the largest credit union in Georgia with 26 branches and 290,000 members, says the “people first” approach is vital to the success of the institution. People are paying attention, too. A report by the Georgia Credit Union Affiliates (GCUA) showed a 6 percent increase in total loans during 2013, most of those coming through automobile loans and home mortgages. Loans were up 11.2 percent for new vehicles and 7 percent for used vehicles. Mortgage loans were up 5.9 percent, with second mortgage loans rising 2.3 percent. The GCUA’s Member Benefits Index found that the average interest rate for a 60-month loan for a new car in 2013 was 2.81 percent at credit unions, compared to 3.61 percent at banks. The interest rate for a 48-month used-car loan was 3.05 percent at credit unions, 1.28 points lower than banks. Savings increased, too. Total savings balances increased 2.81 percent and transaction account balances grew 7.12 percent. One of the issues facing credit unions is the effort by big banks to eliminate the tax-free status enjoyed by credit unions. The legislation has been encouraged by some of the nation’s larger banks as a way to level the playing field. But credit union officials say removing the tax advantage would only mean higher fees and lower rates of return for the members. This, they say, would defeat the purpose of the 1934 Federal Credit Union Act, which was enacted during the Great Depression to relieve stress on family budgets and create an affordable alternative to for-profit banks. Mercer says the average size of a credit union loan is $9,500 and the average size of a deposit account is $8,400, both amounts that would likely be considered small by bigger banks. In attempt to curtail any federal involvement, the America’s Credit Unions action group has created the website DontTaxMyCreditUnion.org. Their goal is to raise awareness and help prevent Congress from enacting legislation that will have a negative impact on the nation’s 98 million credit union members. Halter says the credit unions have plenty of political support in the Georgia delegation, from left-leaning Democrat John Lewis to right-leaning Republican Rob Woodall. Enrollment in credit unions continues to grow. Mercer says the number served nationally is expected to top 100 million this year, with two million of those in Georgia. Credit unions have accumulated $20 billion in assets, and $10 billion of that is loaned back to the members. Most credit unions offer learning opportunities throughout the year. The GCUA found that 89 percent of the state’s credit unions offered an education event in 2013, with nearly 14,000 people taking advantage. There were 68 percent that offered counseling for building credit. Much of the appeal was aimed toward young people: 73 percent held an education event for ages 14-17 and 68 percent offered a class for ages 11-13. There were 93 percent of institutions that offer special savings accounts for ages 11-13, 88 percent for ages 14-17. Delta Community Credit Union calls its plan “Quarter-life,” and it is geared toward the 18-25 demographic. The program helps prepare a young member for making a lifelong series of good financial choices. Contributions back to the community don’t stop at classes for most credit unions. The institutions are well-vested in the areas they serve. NWGCU places an emphasis on helping Rome’s March of Dimes because the featured family was a member. The credit union also supports the Rome Sexual Assault Center because its members and staff are on the board of directors. “We believe supporting those causes that are important to those who support us is a critical part of our marketing function,” Merkle says. At MidSouth Community Federal Credit Union, there is great emphasis placed on education. That comes from the roots of the organization, which was founded to serve teachers in Bibb County. MidSouth presented a $5,000 check this spring to the Middle Georgia State College fund and actively supports Teacher of the Year programs at local high schools. Like most financial institutions, credit unions are concerned about preserving the safety and security of their members’ account information. Cyber attacks and identity fraud can create worries for members and staff. Credit unions are fighting back through member-awareness programs that encourage vigilance in checking statements and protecting financial information. Credit unions also try to stay ahead of the threat by using the newest technology. The credit unions are also upgrading services to better reflect the habits of members. This is shown in an increased effort to improve the online and mobile banking experience.